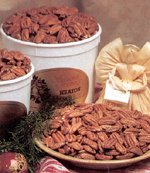 Whether you need plain pecans for cooking or mammoth pecans packaged in gift tins or boxes, Heaton Pecan Farm has them. We have many, many products made with pecans. These products are made fresh daily only using the finest pecans. We guarantee that everything we make is the best it can be. Any of these items can be shipped to your front door anywhere in the 48 continental United States. We ship by UPS, please provide physical addresses. Next time you're traveling through Alabama, stop in and visit. Enjoy a homemade ice cream cone while you browse our gift loft, or sit down and savor our fresh made pecan chicken salad. We're located at Exit 208, off I-65. Seven flavors of pecans in one tin.